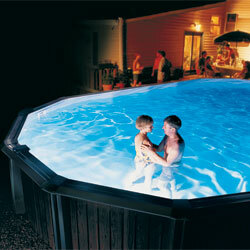 A NiteLighter™ Underwater Lighting System is the perfect solution for your customers’ pool lighting needs. With models for aboveground, inground and now soft sided pools, NiteLighters™ are designed for easy do-it-yourself installation with no draining or drilling of pool required. Each NiteLighter™ is equipped with an outdoor-rated 12 volt transformer. The “Ultra” models feature automatic shut off and three colored lens covers. For a nighttime swim or entertaining by the pool, NightLighter™ Underwater Lighting Systems will turn an ordinary swimming pool into an extraordinary nightlite oasis. 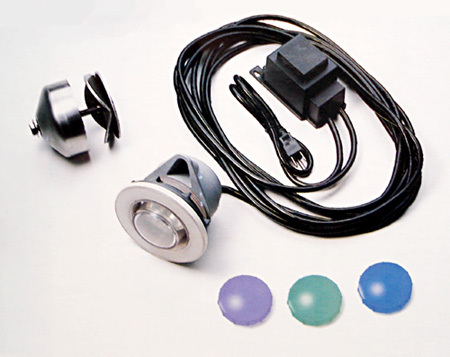 Hayward’s Elite™ Underwater Quartz Halogen pool light is engineered for installation in all above-ground pools. The optical lens disburses the light for full pool coverage. The through-the-wall in-ground design can be installed anywhere around the pool for optimum lighting and doesn’t interfere with the pool’s filtration. The multi-colored lens kit adds an elegant touch to the pool’s lighting, to create a special effect or enhance the mood. The light housing assembly and lens are constructed of a high-grade chemical resistant acrylic material for durability. The light housing comes pre-wired with 25 feet of cord and 120v/12v transformer with on/off switch that can be installed in both storable and permanent above-ground pools.